This book takes the student gently into the world of reading sheet music. The reason is that this is the crucial phase for the student. If the student is given too much too quickly, this is where they will give up. When I was teaching, I became aware of a "fact" accepted by many teachers and even parents: that it was not unusual for a large amount of children to quit music at the stage of starting to learn note reading. Instinctively, this was not something I believed had to be true! I found myself in the position of creating a youth symphony with a group of one and two-year Suzuki students who couldn't read a note. It made absolutely no sense to give them the music pages to the songs they had already played, with a brief introduction to note reading, and basically just "let" them "figure it out." 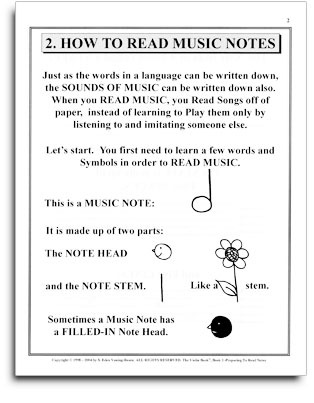 This was the method of practice that was being used by a lot of teachers at that time to teach music reading. There was no step-by-step note reading system available. How could a teacher have control over which note symbol the child had learned and which one he or she hadn't, and which one needed drilling? All children learn at different levels. These students needed REAL EFFECTIVE help on how to read music notes. So I created a system of hand-out pages presenting only one note at a time until all the notes were fully covered. And then I drilled the students over and over on the material until they MASTERED it. When I taught note reading one step at a time, NONE of my students quit. 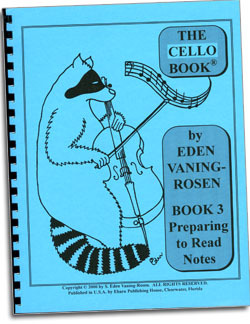 This became the foundation for The Cello Book 3: Preparing to Read Notes. This book is unique, because it gently and easily introduces the elements of Note Reading, without interrupting the sense of accomplishment gained by learning to prepare more and more songs to be played for family and friends. Music Notation looks like a whole new foreign language to me. Just how hard is it to actually learn what all these symbols mean? Each symbol is presented one at a time and clearly defined in a clever way so that the student will be able to remember and use it easily. You'll love the ease with which you will learn to read music notation. What are the secrets of following a Conductor in an orchestra, and how do the bows of the cello players always seem to go in the same direction at the same time? What the Conductor is doing is on Pages 52 - 57, and the secret of those awesomely together bow strokes is on Pages 8 - 11. Is it hard to play fast on the Cello? Learning to play fast notes on the cello is easy when it is learned as a gradually developed skill. Young students often attempt to rush through everything. Most people really appreciate the carefully presented fast note approach introduced on Page 22 and used throughout Book 3. How well will my child be playing now? The Subjects of Counting and "Feeling the beats" are thoroughly presented to give students the confidence of gaining self-discipline over the accuracy of their playing. By the end of Book 3 you will be well on the way to being fully prepared to read music, and you will know and be able to play many songs in front of your family and friends. If one follows The Cello Book Series Program, not skipping any pages or drills, and carefully learns each part, a well-taught, confident Celloist emerges who has the Technical expertise to reach any level of dreams of artistic endeavor he could wish to accomplish.